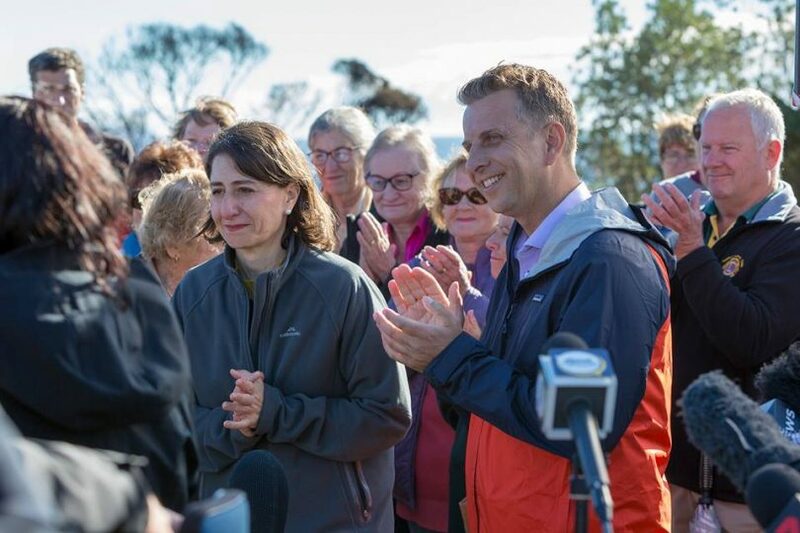 NSW Premier, Gladys Berejiklian and Andrew Constance in Tathra, March 2018. Photo: Andrew Constance Facebook. Member for Bega and NSW Transport Minister, Andrew Constance has rejected claims he is gearing up to stand in the seat of Gilmore and switching from state to federal politics. NSW Shadow Treasurer, Ryan Park has suggested pre-recorded ‘robocalls’ to residents in the Eurobodalla, Shoalhaven, and Kiama based seat reveal that the Liberal Party is canvassing support for Mr Constance. Gilmore will be vacated by the current Liberal Member Ann Sudmalis at the next Federal Election. Ms Sudmalis announced her retirement from parliament in sensational fashion in September claiming she had been the victim of branch stacking and bullying within her party. Ms Sudmalis is currently in New York representing Australia at the United Nations General Assembly with retiring Labor MP, Jenny Macklin. With Gilmore on a knife edge, NSW Labor is stirring the pot. “As the people of NSW and Bega look to choose who represents them for the next term of government, one of Ms Berejiklian’s senior Ministers is jumping ship,” Mr Park says. Speaking to Region Media, Mr Constance says the claims are rubbish. “I have registered as a candidate for Bega at the March State Election,” he says. The claims follow recent reports in The Australian newspaper suggesting that Labor’s Leanne Atkinson could take Bega from the long sitting member come March 19. According to The Australian, leaked Labor polling lists Bega as one of six Coalition seats where Labor is ahead in the polls. Mr Constance has held the seat since 2003 and comes to election day with an 8.2% margin. The gap is much close next door in Gilmore, where Ann Sudmalis beat out Labor’s Fiona Phillips in 2016 by 1,500 votes or a 3% margin. Ms Phillips is contesting the seat again in 2019.